This is what you've been waiting for, Killing Floor fans. The sequel is here. In April 2014 we got an exclusive first look at Killing Floor 2. We talked to developer Tripwire Interactive about building the most advanced gore system in gaming (seriously, it's really gross) and animating guns at more than 200 frames per second. 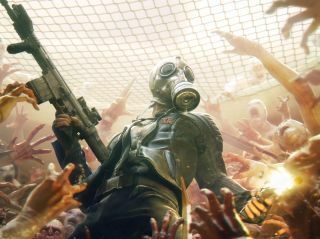 Now, a year later, we've gotten the first hands-on with Killing Floor 2, which is releasing on Steam Early Access in the near future. For this episode of the PC Gamer Show, Tripwire co-founders John Gibson and Bill Munk join us to shotgun Zeds and sledgehammer Zeds and katana Zeds and grenade Zeds—you get the picture. We also sit down for an interview about their last year of development, what we should expect from KF2's Early Access launch, and more. If this episode of the PC Gamer Show leaves you ready to explode into giblets at the thought of more Killing Floor 2, watch our video of an entire, uninterrupted match with commentary from Tripwire. Please don't actually explode into giblets, though. We'd feel bad.